The drive to work on Tuesday November 13th was a little unusual. Just after the roundabout we looked to the left and saw the hovercraft partially under water! A pretty unusual sight so we stopped to take some pictures. We still don’t really know what happened. Rumor is there were 30+ passengers onboard. No one was injured; they made it safely to shore. 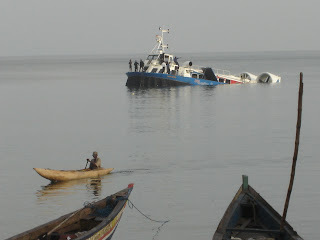 The hovercraft was on its way to Aberdeen from Lungi. According to some, the engine caught fire. Other stories are that the filters of three engines were blocked, causing trouble. Supposedly they ran out of fuel and a boat came to refuel the craft. Some say that the boat crashed into the craft, causing damage.